Netflix, the online streaming service has given us new reasons to celebrate 2019. To all the enthusiasts who have been eagerly waiting for the commencement of season 3 of Stranger Things, we have great news for you.. When will Stranger Things Season 3 premiere on? The online streaming service, Netflix took to Instagram so as to make the public announcement of Stranger Things Season 3. You have heard it right. Your favourite TV series’ third season is arriving soon. According to the announcement by Netflix, season 3 of Stranger Things will premiere on 4th of July of the current year. It’s on the Independence Day of the United States. 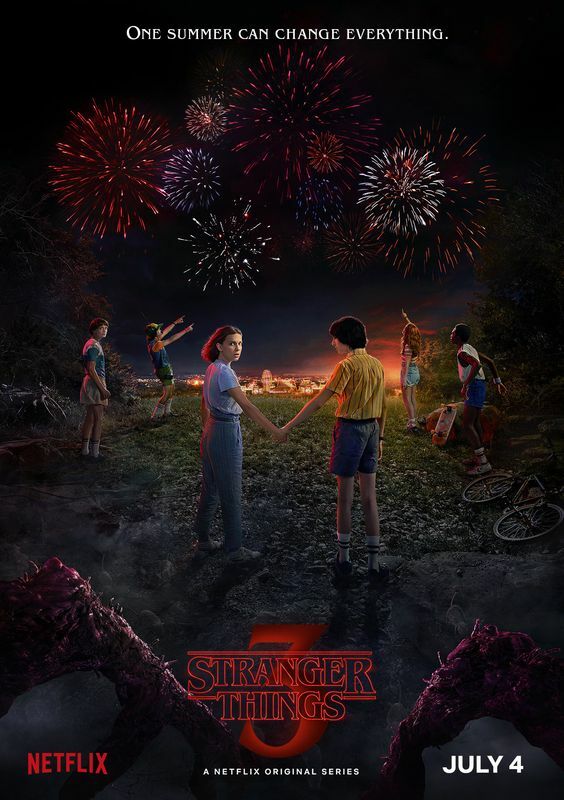 Netflix has also released the posters of season 3 of Stranger Things. It was also unveiled by Netflix, that season 3 of Stranger Things will be eight seasons long. This season three of Stranger Things was dead cert even before season two had premiered in the October of 2017. However the official announcement by Netflix was made late last year. Recently, Netflix had even celebrated Stranger Things Day, which was the first one. The Stranger Things Day was celebrated on the 6th of November 2018 which happened to be a Tuesday. Netflix has also released a trailer for season 3 of the Stranger Things. It is basically a short teaser which is in the form of an ad. The ad is for the new mall that is in Hawkins. It features Steve Harrington (Joe Keery) and Robin who is a newcomer. The two have been featured as ice cream vendors. The fans of Stranger Things have good news that the original cast has been retained by Netflix along with the two additions of season two: Max and Billy. Its just a wait of a few months when the fans will get back to watching their favourite TV series. Google Maps or Apple Maps : Which Mapping is Better?